Tostones are a popular side dish and snack item in the Dominican Republic. The name comes from the Spanish verb tostar which means "to toast". I saw them referred to in other recipes suggestions for side-dishes so thought I'd include the 'recipe' for this very simple dish. 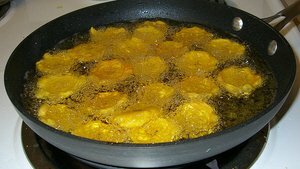 They are in fact featured in the cuisine of various Latin American countries and are sometimes referred to as patacones. circular slices all about a centimeter (1/2 inch) thick. In effect the plantain slices are fried then refried. Initially The slices of plantains are fried for 1-2 minutes on each side so that they take a nice golden color. They should then be and removed onto kitchen paper and have any excess oil blotted off. They now should be softened in the center and crispier on the outside so they should be quite easy to 'squash' to a flatter profile using a steady, gentle pressure from a flat bottomed kitchen implement. Traditionally a tostonera is used -- but anything that can 'squish' the pieces evenly to a disc about half a centimeter (1/4 inch) thick would be good. The plantains are then dropped back into quite hot fat and fried once again until they are crisp and golden brown. A delicious homely snack,and a great accompaniment to many other Dominican dishes! In effect they take the place of 'French fries' or chips and they area popular item throughout Latin America, but nowhere moreso than the Dominican Republic. Note: As with all deceptively simple dishes it is easy to 'ruin' tostones if your fat is not hot enough. The plantains can become soaked with oil and less pleasant to eat! So be sure the have quite hot oil to seize the slices, and 'blanch' them initially (don't be tempted to put them in before the oil is hot, and don't overload the pan and take the heat out of the oil too much -- rather do them is several batches if making a lot) -- and finish them in slghtly hotter oil to get that nice golden brown crisp exterior -- Yum! Tostones are best eaten straight away! Your country is amazing having wonderful people you are too good and we will definitely coming to your homeland. Traditionally a tostonera is used -- but anything that can 'squish' the pieces evenly to a disc about half a centimeter (1/4 inch) thick would be good. Delicious. Unlike previous reviewers I encountered no problems from briefly dipping the once-fried chips into salted water. I was well aware of the taste of different dishes from Dominican republic. But this totally new for me. It looks like a delicious starter or side dish. I am learning more and more about Dominican food. Thanx for such an informative post. I think of the readers of this site are grateful for your job.